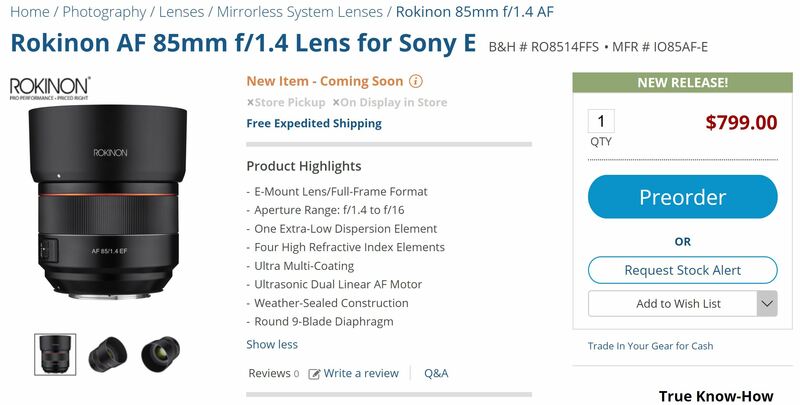 Rokinon AF 85mm f/1.4 FE Lens Pre-order at Adorama is $100 Cheaper than at B&H Photo ! The new announced Rokinon/Samyang AF 85mm f/1.4 FE lens for Sony full frame mirrorless cameras now also available for pre-order at B&H Photo Video for $799, but at Adorama you can pre-order this lens for $699 ($100 Cheaper). Previous Previous post: Sony RX0 Mark II now Available for Pre-order at Amazon ! Next Next post: Sony RX0 II now Available for Pre-order at B&H/Adorama/Amazon !